Be The First to Review the Friday Night Fever Trail Race SERIES PASS - 4 RACES! The Friday Night Fever Trail Race SERIES PASS - 4 RACES is a Running race in Evansville, Indiana consisting of a 5K. Come out and enjoy an evening of running under the stars at Angel Mounds. The July race will be before sunset giving you the opportunity to run the race course in the early evening light. The following 3 races will be under the light of the moon and stars. Each runner is required to have one working headlight or flashlight with them. The trail will be marked with glow sticks and directional signs. We encourage you to spend some time at the beautiful Angel Mounds with your friends and family. 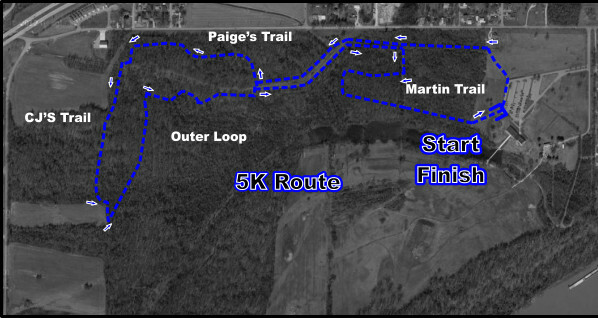 Take advantage of reviewing our course map for the series races. Each race will earn competitor pointsKeep Reading toward the series titles. Your fastest three out of four times will be combined to determine the series champions. SERIES PASS- $100 and includes all of your free swag* at each race AND an additional race series sweatshirt($40 value) that will be available at the series finale in October. DEADLINE TO REGISTER FOR SERIES PASS IS 7/8/19. *extra fees will apply to sizes 2XL/3XL.